Happy Easter to all my blogging friends! Here is a little Easter decoration I made for the season. 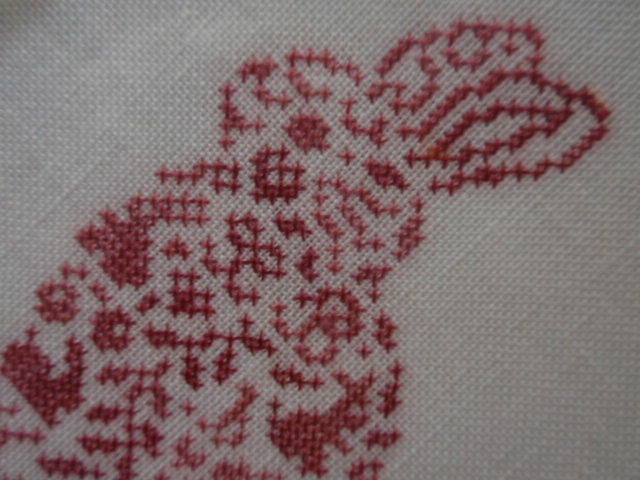 It is from Trilogy on 32 ct. linen. I left off the alphabet that comes at the bottom of the pattern, turned around the bottom border to be opposite the one at the top and added the ribbon. Happy Easter to All! 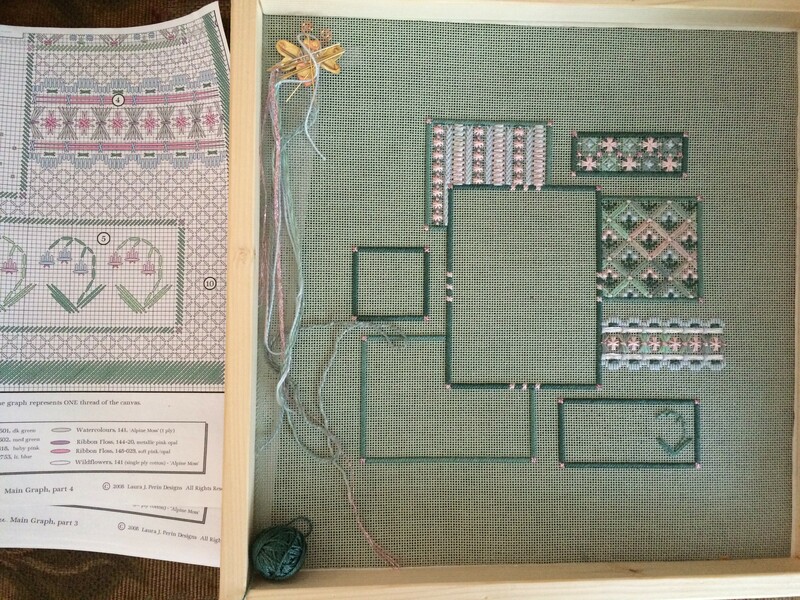 I actually did work on my unfinished projects…but slowly. I went away to Colorado in January/February to care for my son (who was in a 12 week recuperation after serious back surgery) and my little 3-1/2 year old granddaughter while his wife was out of town. When I returned it was difficult to get the MOJO back for the PhDs. 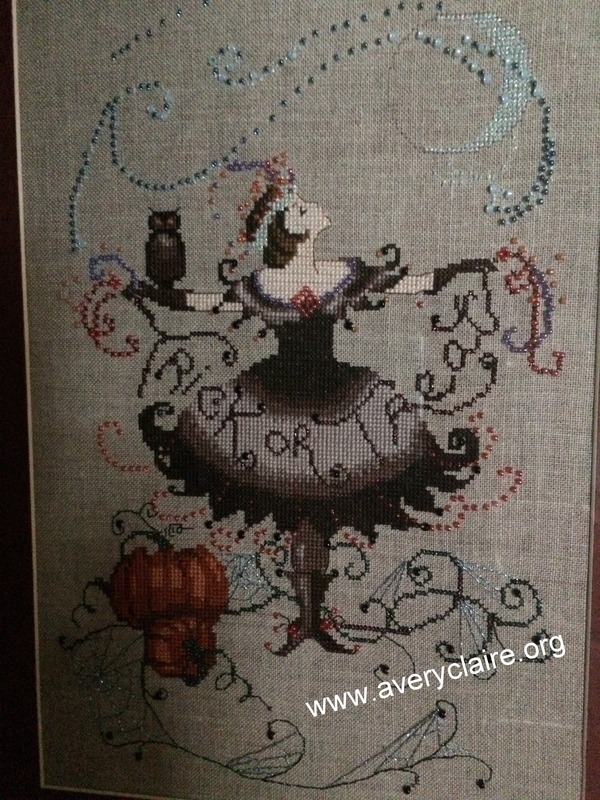 However…here is my completed Halloween Fairy. It is seriously difficult to photograph something that has already been framed and sealed under glass! I will remember for next time! 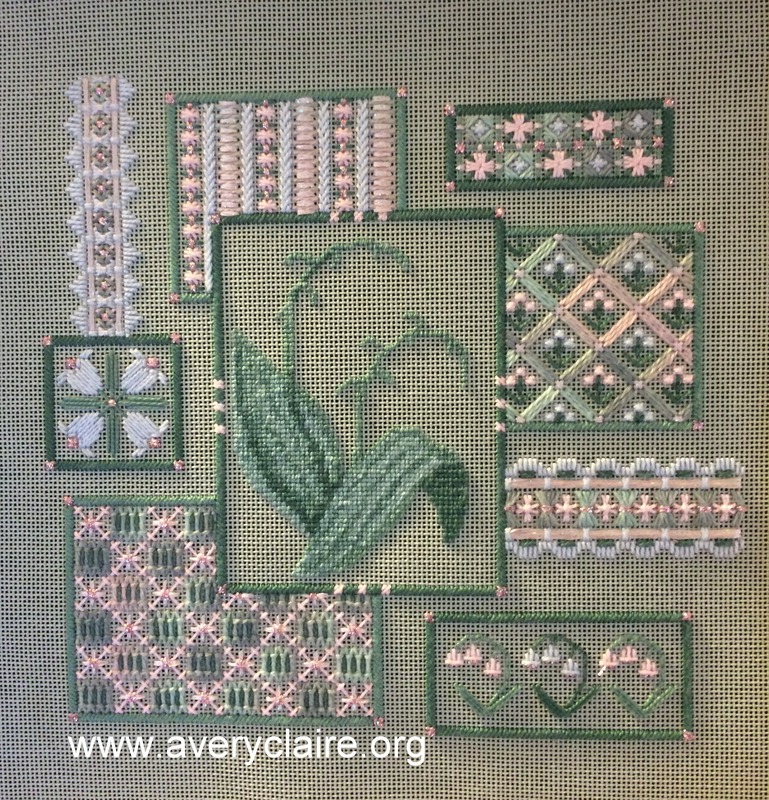 Slow progress being made, but coming along nicely is my Lily of the Valley collage. Here are the before and after photos from last post. 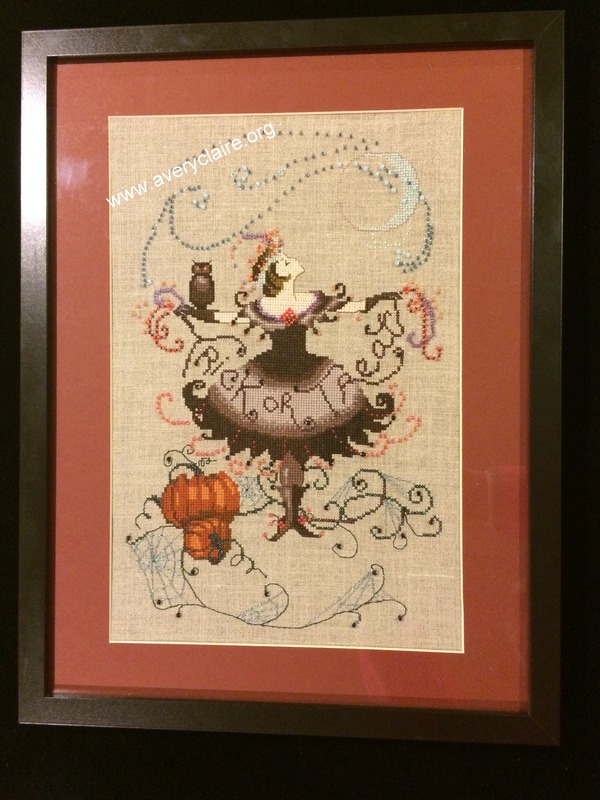 And last but not least are two projects completed a LONG TIME AGO…but are finally professionally framed. 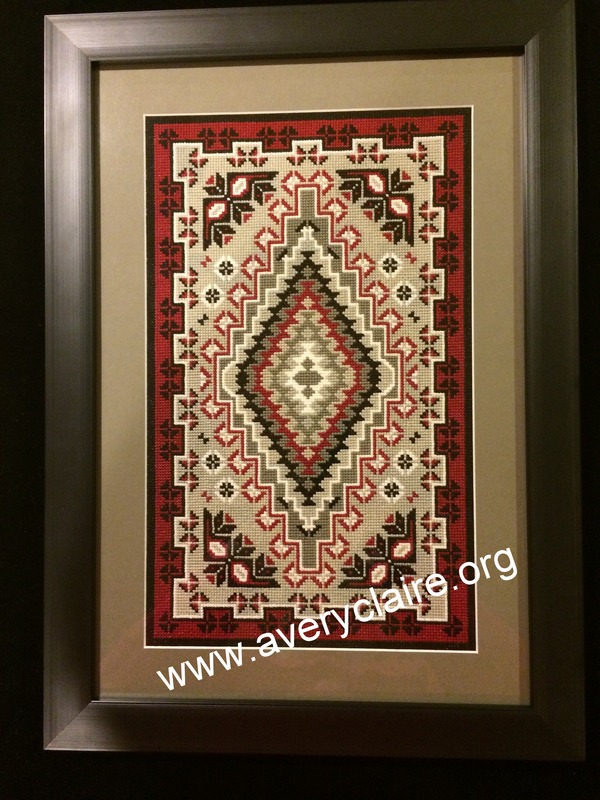 They are cross-stitched replicas of two Indian rugs which I did for my husband to hang on the wall in his den. 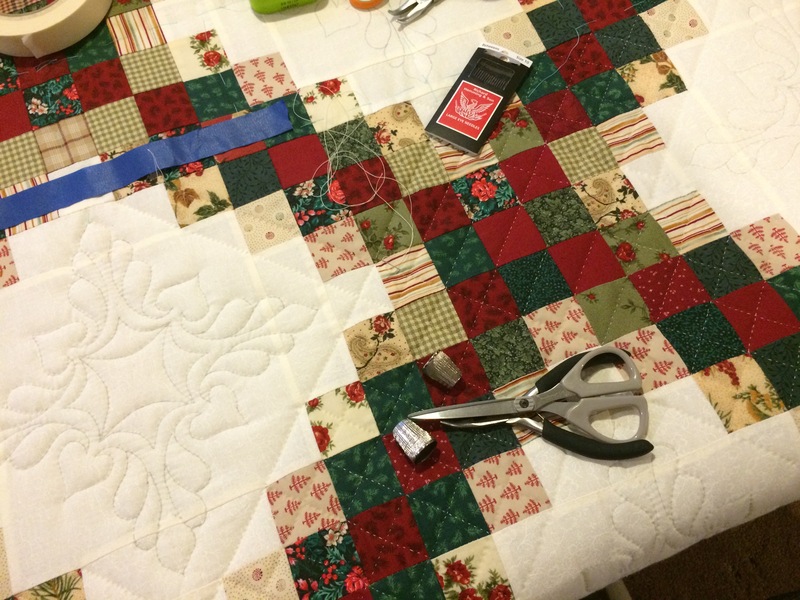 There is NO progress to report on my large red and white quilt which I was machine quilting myself….it remains unfinished. 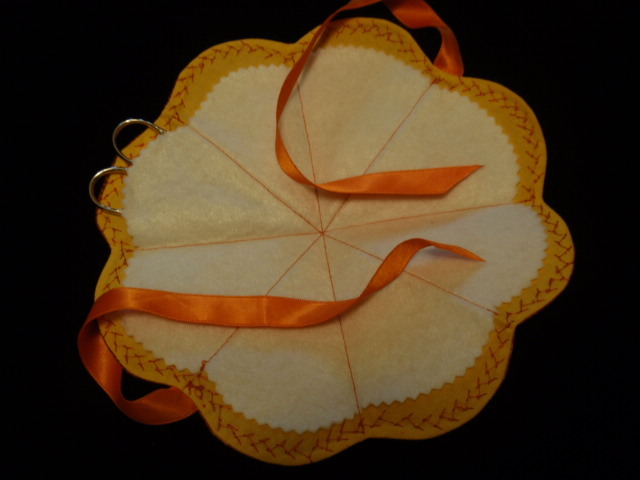 No work done on the Lorna Bateman pin cushion either. We are now on row five of the nine rows of the huge king size red and green Irish Chain quilt. Lots of work to go, but steady progress being made. 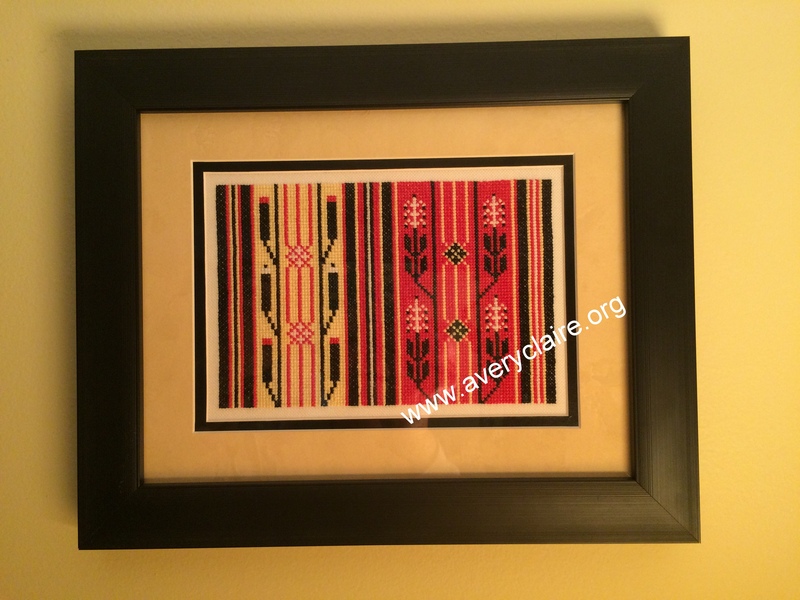 I worked on a couple of other small needlework projects which I will show next time. So much for the long grey Chicago winter. I think Spring is finally coming…the daffodials are peeking up and a few crocuses are blooming! Yes…it’s been six weeks…going on two months. I’m just not good at posting often. I hope you will all forgive me for the times you visited and found nothing new. But….I HAVE been enjoying my retirement. 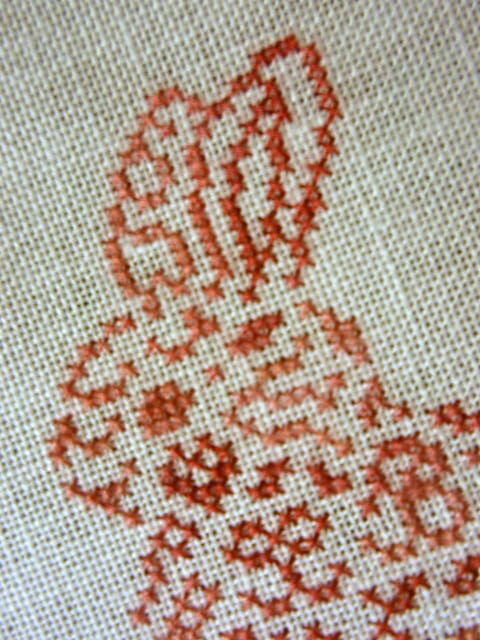 I am slowly working on “Briar Rabbit.” Love him, but he’s really tedious. It’s a Cedar Hill pattern (I love their patterns), but can’t wait to have him done and framed. 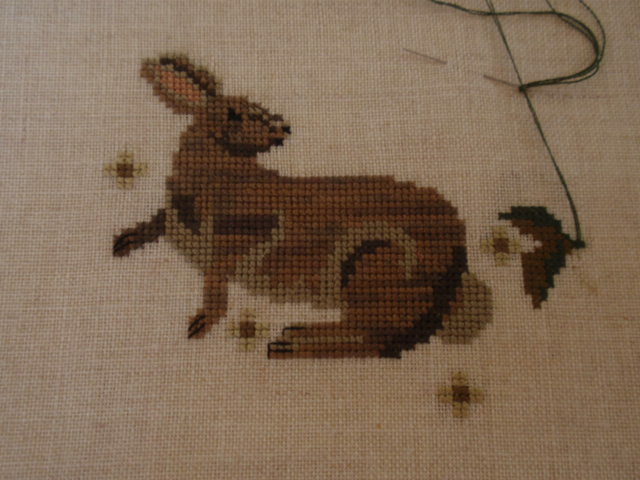 I wanted to do a rabbit for Easter, but I must not be in the mood. 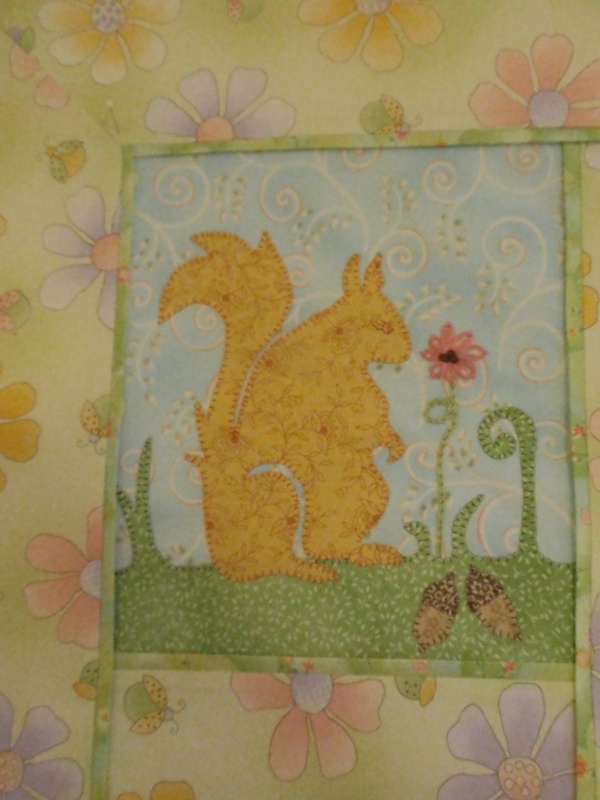 Perhaps my focus has been more on quilting lately. Ahhh…whereever the spirit pours out the creativity I guess. 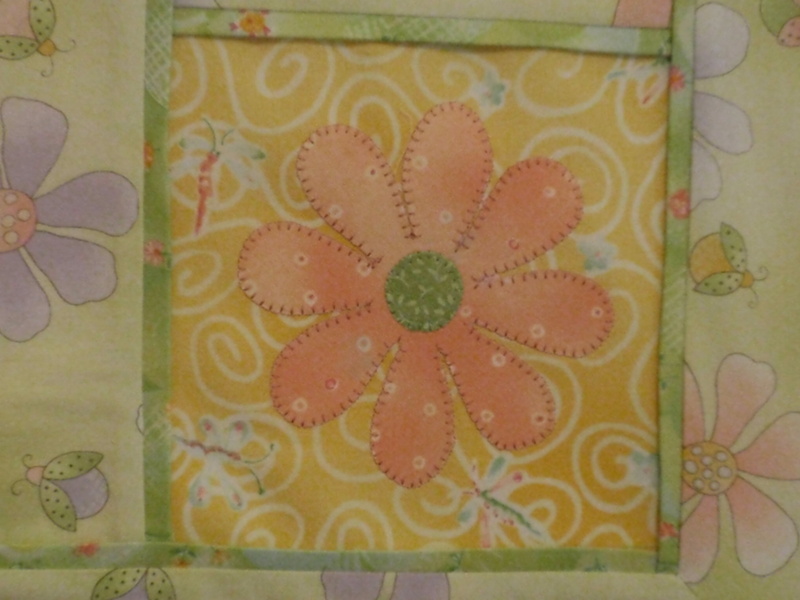 Here’s a peek at the quilt top I have created for our new baby granddaughter-to-be due to arrive in July. 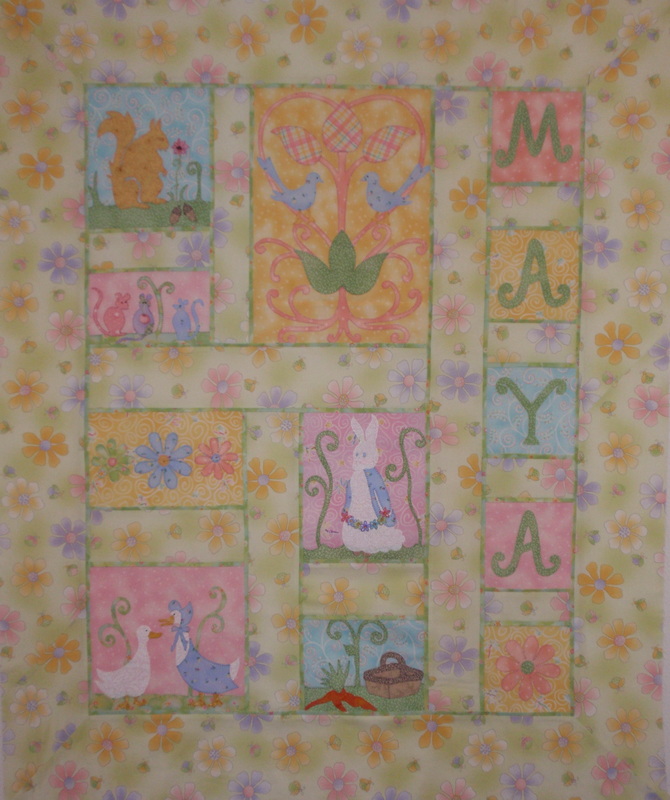 Her name is going to be “Maya” and her Mom likes Beatrix Potter’s Peter Rabbit……so……here are some of the blocks. Here’s Peter….with an embroidered flower garland…. and here’s Johnny Town Mouse, Hunca Munca and Tom Thumb…. and some hearts and birds and pretty scrolls…. 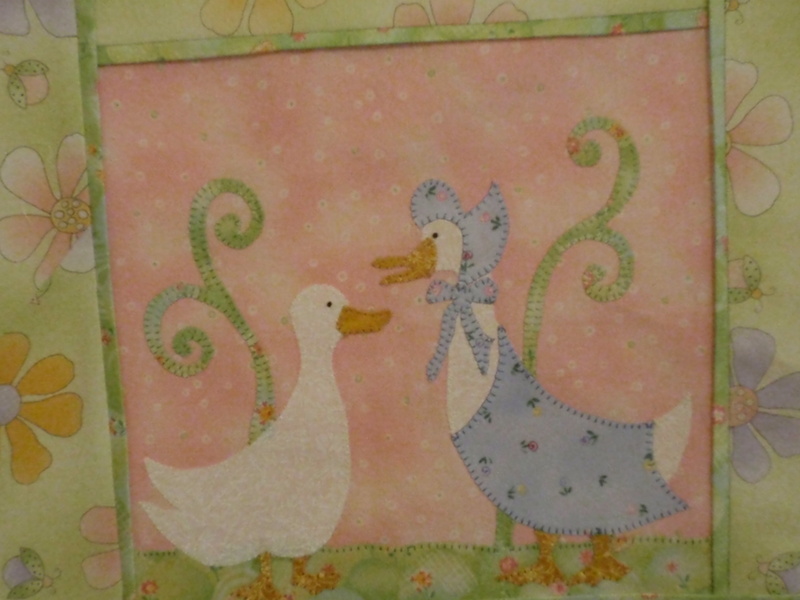 and here’s Jemima Puddle-Duck and friend…. 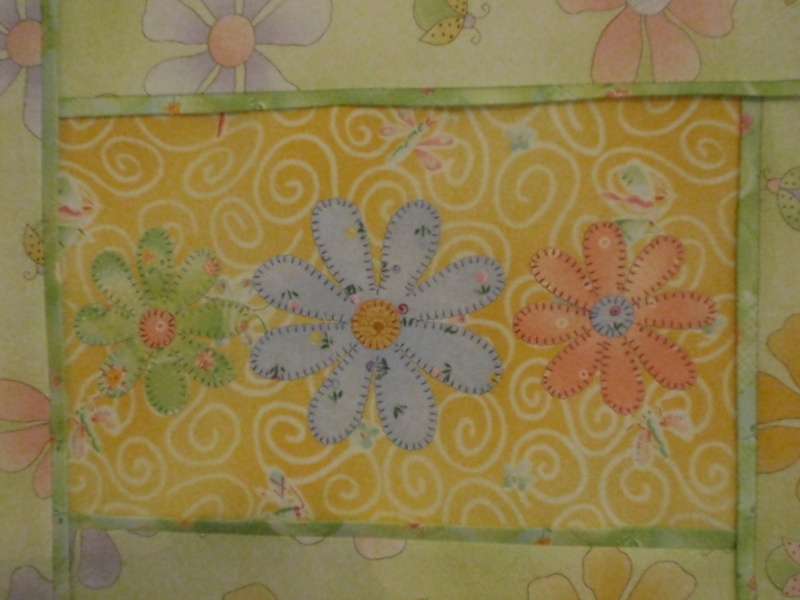 and voila…..the quilt top waiting to be quilted. 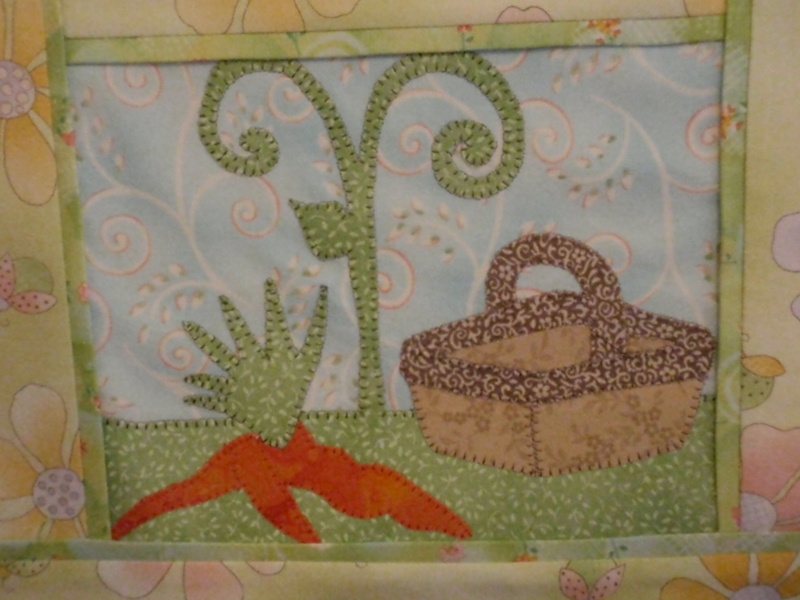 The block patterns came from the book “More William Morris Applique” by Michelle Hill. 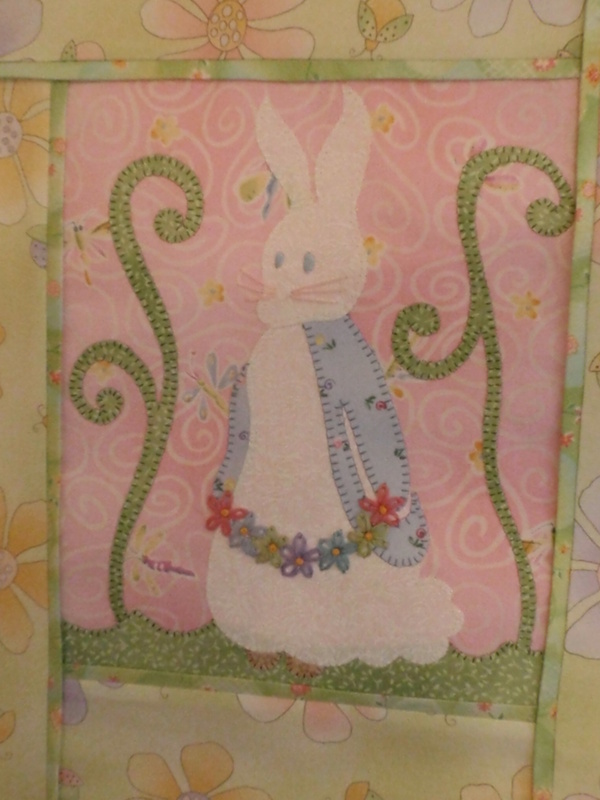 Her pattern was made with William Morris fabrics. I wanted something more pastel and I wanted to make it larger. So I added sashing where there was none….and I added the blocks with the letters to spell the name “Maya.” I drew the letters by hand. And because it was so very pastel I also added the flange cording around the blocks and sashing. It helps to separate something so pastel that does not have a lot of contrast. 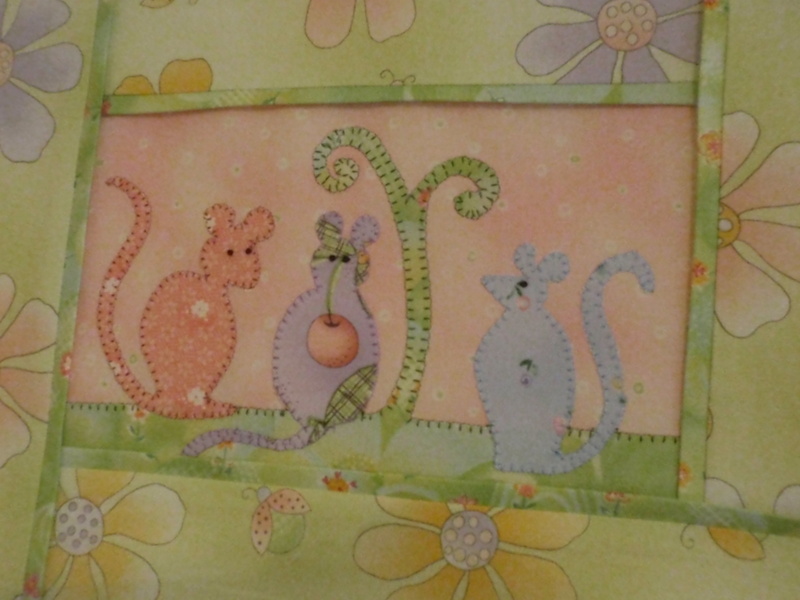 The blocks were machine appliqued. 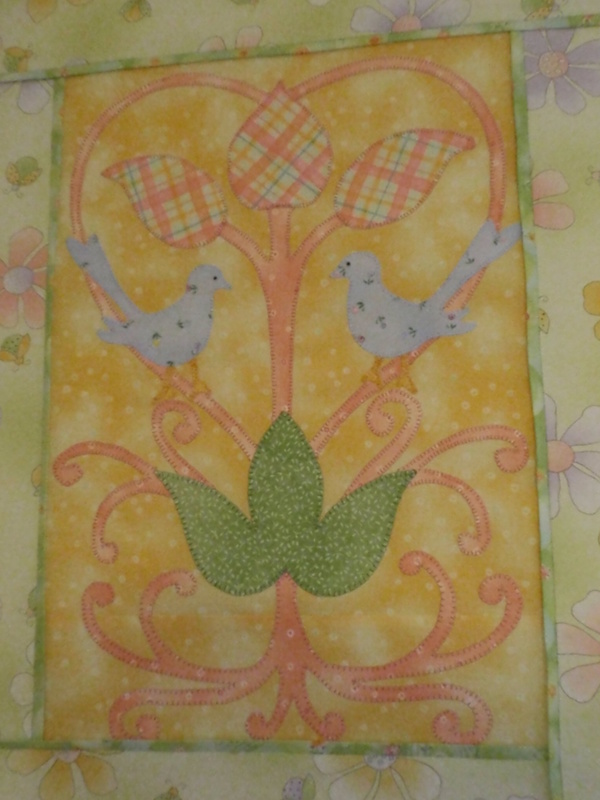 There will soon be a baby shower and I hope the top is quilted and complete in time for the big day. 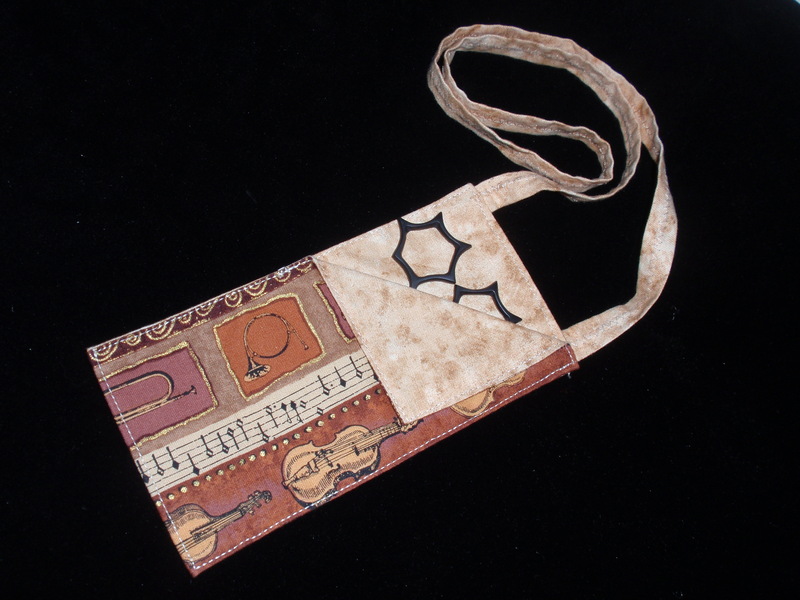 It was a lot of fun to make and prodded my creative touch with the changes I made to the pattern. It now measures about 40 x 50. 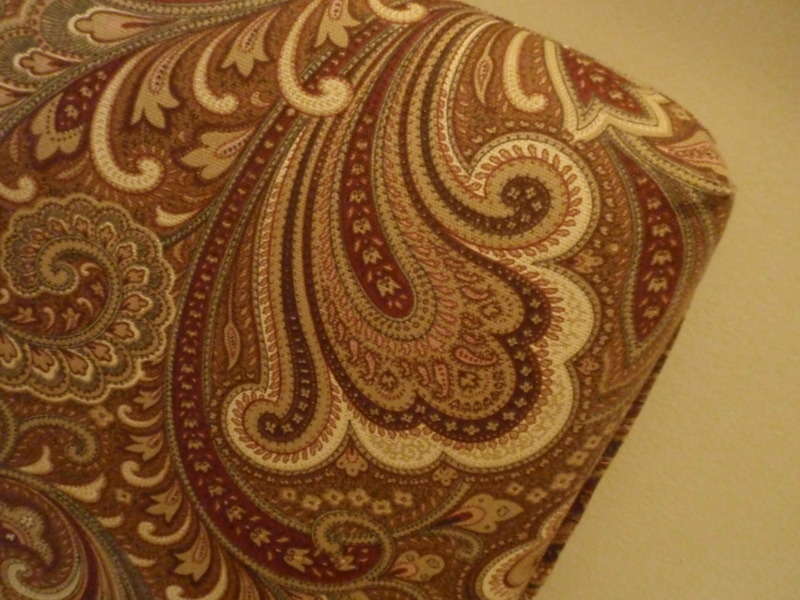 And last but not least….I made a new cushion (approx. 16″ x 50″) for my son and daughter-in-law’s foyer bench. A request that somehow remained set aside for more than a year. It feels good to check things off the to-do list. I pray all of you are enjoying warmer weather and hints of Spring. My walks on these warm days are delightful and inspiring. Back to the rest of the “to-do” list…. I have received the MOST wonderful exchange gift from my friend Maggy. She made me this lovely needlecase. 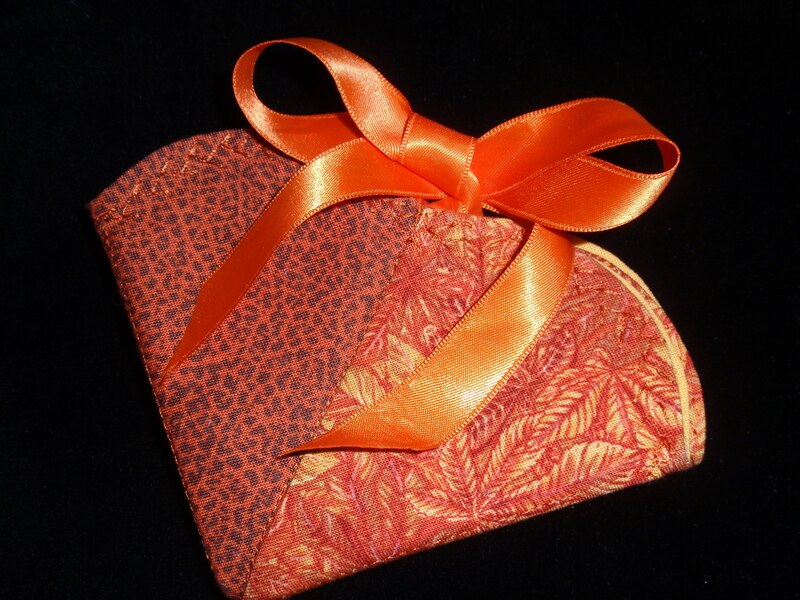 I adore autumn colors and she chose the loveliest fabrics. She also put lovely delicate feather stitching around the edge! 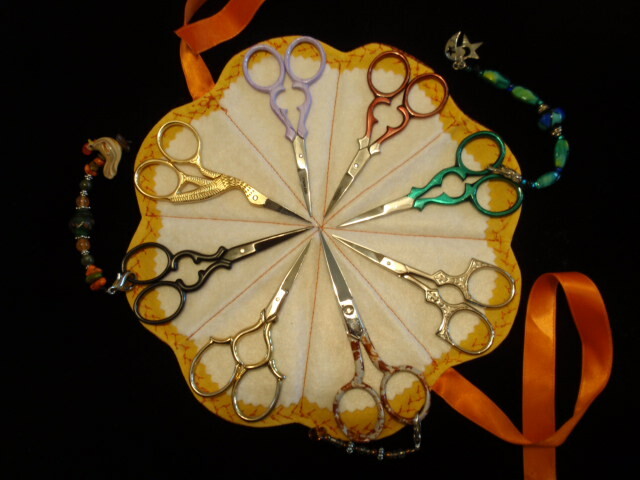 It will be great to hold a pair of my scissors………. or perhaps a good portion of my collection!!! And she even made me a lovely scissor holder to use while I am working. I am always losing my scissors in the cushions, so this will save them! I love both of these handmade items. Thank you Maggy. We have decided that an exchange for Les Muguets Day (May 1st) will be the perfect time each year to have a little exchange. I must begin thinking of something special for next year now. 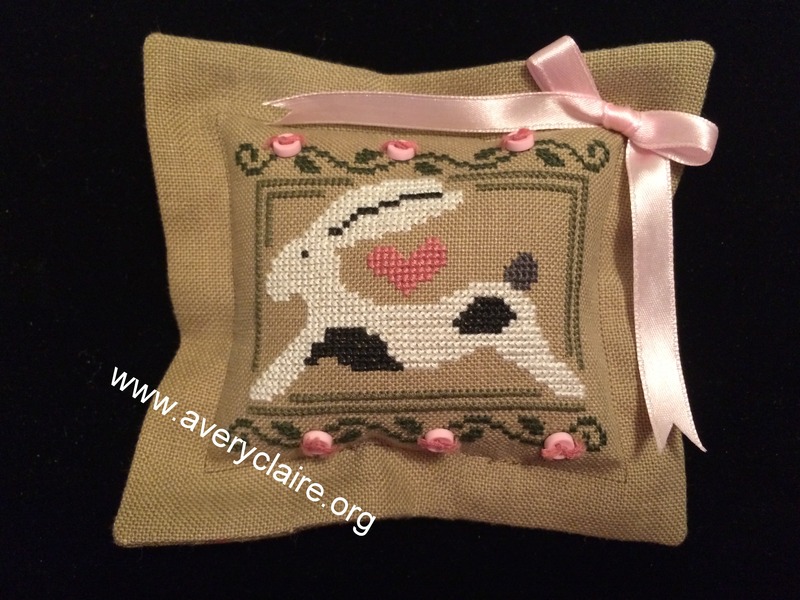 I posted last week about the gift I sent to Maggy….but this week I am sending a small gift for Maggy’s daughter who recently had a beautiful little baby girl. 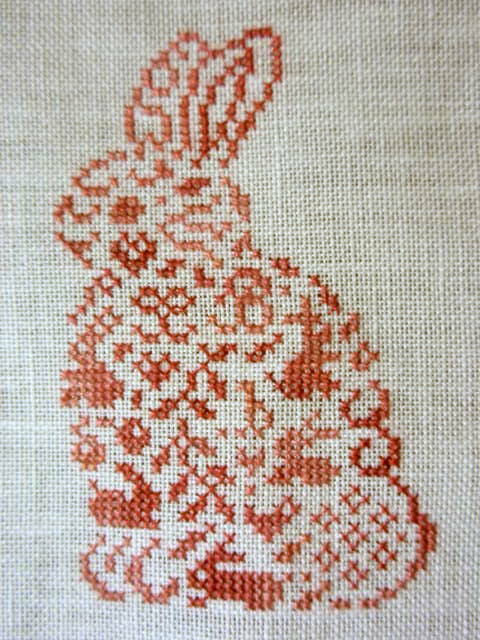 You have seen photos of this bunny before, but it is completed now. 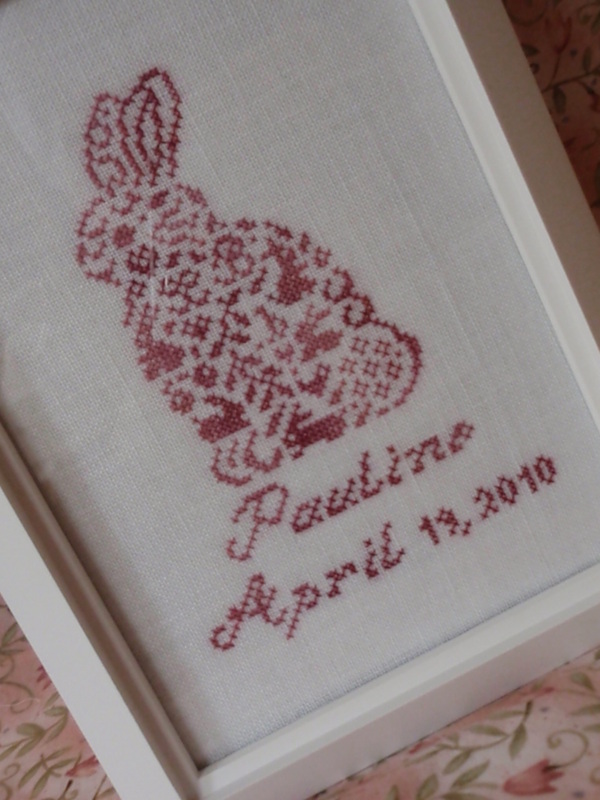 I finished the bunny and was waiting to add the name of the baby and the date. 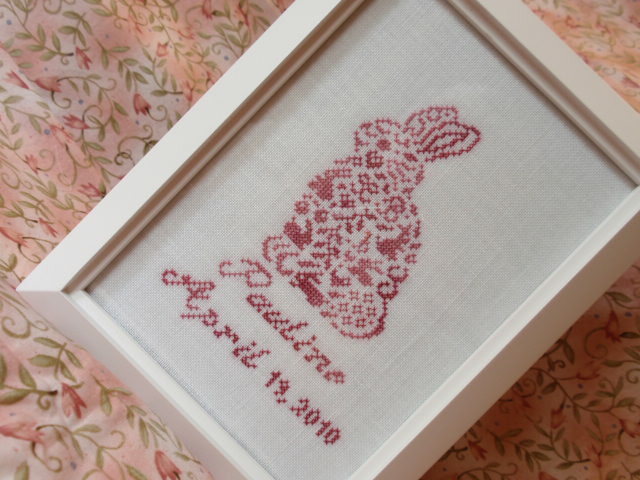 Baby Pauline is absolutely adorable….all pink and pretty. Maggy now has three grandchildren! Congratulations!!! May all of my family and friends be blessed with a joyful Easter weekend! !